Incineration of different types of waste including domestic (municipal or camp waste at sites), and industrial/hazardous waste is a common practice in Canada. While waste incineration can reduce the volume of solid waste significantly and prevent wildlife interactions, it is governed by various regulatory requirements and guidelines. To comply with these regulations, and know when additional treatments are necessary, the users need to understand the roles of waste characteristics, incinerator design, and operational best practices. 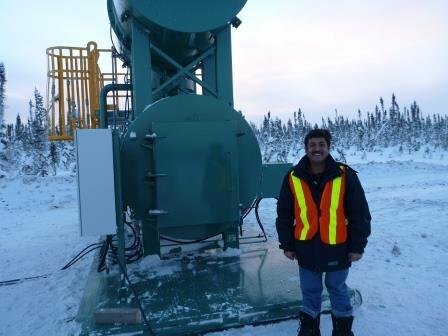 Dr. Yogendra Chaudhry, Vice-President, ECO Canada has previously worked with incinerator manufacturers and incinerator operators to ensure that organizations understood the incineration requirements, good operational practices and meet environment, health and safety requirements. He shares his experience in the following Q & A. 1. What advice would you give to corporations considering incineration as a waste treatment option? The design of an incinerator is based on the waste quantity and waste characteristics. To choose a unit that best meets your requirements; you need to understand your waste streams in terms of its composition and waste generation rates. Some of the important characteristics to be aware of are the bulk density, moisture content and calorific value of your waste stream. For example, a “Type-0 waste” which is mostly comprised of paper, cardboards or plastics may have a moisture content of about 10% compared to about 70% in a “Type-3 waste” which is domestic waste. Since these waste streams will have different bulk density, moisture content or higher heating value, they will burn differently in an incinerator. An inadequately designed incinerator for your type of waste or inefficient operation may not only result in toxic emissions but can also have severe occupational health and safety concerns. Waste segregation is an important requirement for any safe incinerator operation. Make sure unwanted material in your waste is not a part of your waste stream that goes into the incinerator. Metal cans: a metal can will not burn in the incinerator but it can damage your refractory. Plastics: Burning plastics can generate toxic emissions. Instead, send plastic waste streams for recycling. Aerosol containers: An aerosol container can damage your incinerator; it can also pose severe health & safety risk to your incinerator operator. To have an effective waste management system, have a waste segregation program in place. Waste segregation at source is the most efficient and safe way to deal with your waste streams. 2. What role does awareness play in operating incinerators safely and responsibly? At most sites, the incinerator operators are responsible for many other tasks. Often, they do not receive adequate training on waste segregation and its importance, how to operate the equipment safely, and the risks and hazards associated with waste incineration. As a result, I have seen operators overloading the incinerators, working without adequate PPEs, or throwing inappropriate wastes like pails of waste kitchen oil, aerosol containers, and even small empty propane tanks into the incinerator. Often the operators assume that it is ok to throw any waste inside the incinerator, as eventually it will burn down. However, they are unaware that by burning these materials they are releasing harmful gases and endangering themselves, the workers in vicinity and the environment. It is necessary to understand the basics of incineration and regulation behind waste incineration to operate incinerators safely and responsibly. 3. Why should people take advantage of our recorded webinar with Dr. Albert Liem? Dr. Albert Liem has dedicated over 3 decades of his life in doing the research on the waste incineration technology and has tremendous knowledge in the field. This webinar is an excellent opportunity for individuals to learn the science behind waste incineration from a leading expert in North America.